For the last seven years I’ve had a Tuesday morning volunteer gig at a suburban Philadelphia hospital’s medical office building. There, I man the information desk from eight o’clock till noon, helping people locate their doctors’ offices, the cleverly hidden restrooms, and ATMs so that they can pay to get out of the cash-only parking garage behind the building. Incredible to me, it seems to be de rigueur for lots of folks these days to carry nary a dollar on their persons. Plastic rules, except at the parking garage. Wouldn’t you know it, though? . . . there isn’t an ATM in the garage or the medical building. So, off on a two-block trek to the closest ATM the short-on-cash folks depart. I was at my post last Tuesday, the 11th of April. Looking through the lobby windows I could tell that the Sun was blazing away deliriously. My iPhone said that the high for the day would be 83°F. Yeah man, that sounded fine to me, a non-Sun-worshipping guy who normally isn’t thrilled when the thermometer climbs above 74 degrees. But after all the rains we’d had in recent weeks I was psyched for a bright, overly-warm spring day. I wasn’t alone in that feeling. Inside the medical building two humans of the male variety were taking their cues from our winged friends that undoubtedly were chirping away merrily outside. I heard one of the patients singing freely and loudly as he entered the elevator, on his way to get checked out in an upper-level doctor’s office. And I heard another whistling a happy tune as he exited the building through the main door 20 feet from the information desk. His doctor must have given him a good report. Good golly, Miss Molly, there and then I decided to have a look that afternoon at how spring was shaping up in my neck of the woods. I would be in search of colors. And so I spent an hour and a half in early afternoon wandering, on foot, in three of my town’s neighborhoods, including my own. These are modest areas filled with no-nonsense homes from the last century’s early and middle sections. Things are neat and tidy here, but usually not exactly eye-grabbing. But when cherry and dogwood trees and azaleas and rhododendrons and all the rest open their floodgates, watch out! The streets then, for me anyway, rise above snooziness. Charm and loveliness take over. Alas, I’m here to report that not much out of the ordinary was happening color-wise on April 11. Bummer, indeed. In fact, many streets hadn’t escaped from their leafless winter doldrums, though here and there some trees were beginning to sprout delicate, new leafage. As expected, there were plenty of greens to be seen — lawn grasses and evergreen trees. And there was no shortage of browns, obviously, what with tree trunks all over the place. But soft colors that make you ooh and ah, and vivid colors that go pow? 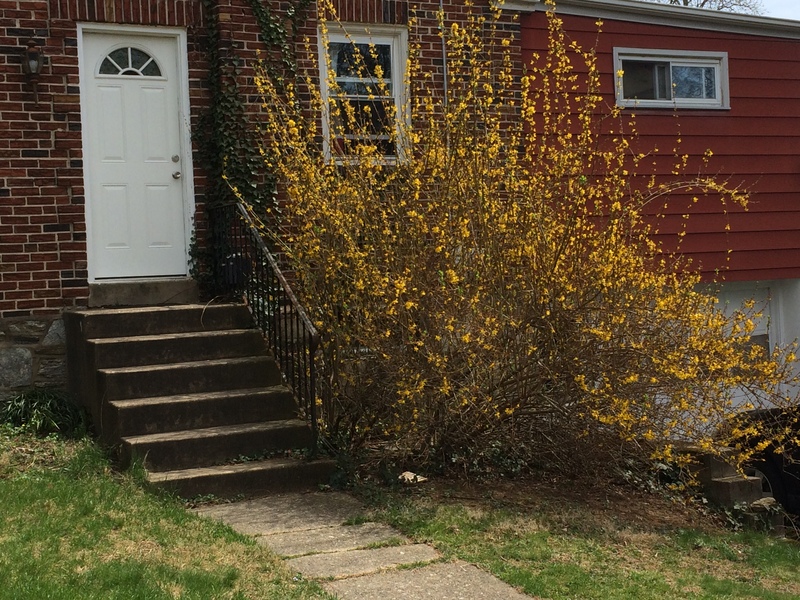 Well, some cherry trees were in bloom, and a smallish number of azalea bushes were festooned with flowers tinted in strong lavender, and a far-less-than-I-expected quantity of forsythia were unfurling their yellows, and . . . that was about it. There even was a shortage of revved-up flower beds. Thus, I hurried to my car, snapping the last of my photos. Macy’s, not Nature’s hues, called! Maybe in a future article I’ll report on the degree of shopping success I encountered at the mall. The world, I know, anxiously awaits that information. In any case, I’ll wind up these proceedings by saying that I hope you have enjoyed the photographs that I’ve placed on this page. 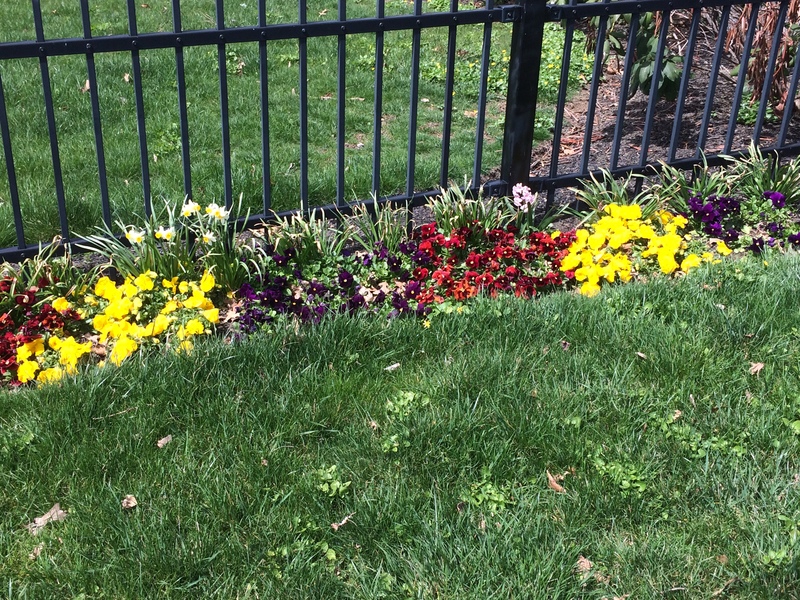 Though my springtime adventure wasn’t a 10 (hell, it was more like a 4), I managed to document some decently lovely and colorful vegetative sights. Next year, perhaps, I’ll improve my timing and write a piece about spring in all its glory. Hi, Jerry. 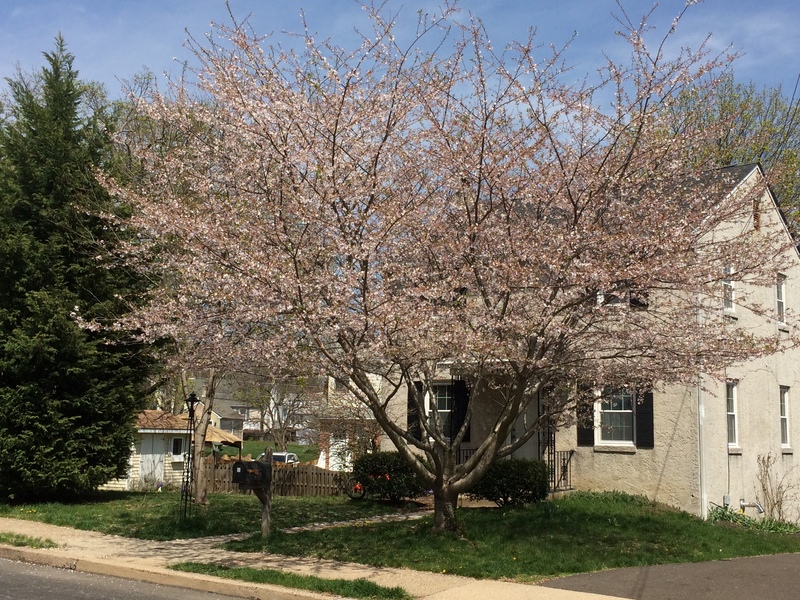 No surprise, but many more flowering trees have opened up in my area since I went out on the walk that I write about. I enjoyed your spring story and pictures. I hope you do more when colors arecout full force. There’s a good chance I’ll do that next year. Thanks for adding your thoughts, Joyce. Nice post. One year I tried to take a photo a day of the gardens/natural world in our area. I dated all the pics and it’s interesting now to compare and contrast. Can be a good fortnight of difference with that sample year. In Scotland my forsythia is now in full bloom but the cherry blossom isn’t out yet! Hi, Alyson. For sure, Nature can be unpredictable and variable. I remember visiting my in-laws years ago, when I was in my early 30s. They lived in the country, and my father-in-law had recently retired. I distinctly remember him looking out the window and musing about the squirrels and birds at the birdfeeder. Hopefully when I retire (if I can), I’ll take more time to “smell the roses” and soak in nature and the simple things. Nice post! Afternoon, Pete. One thing about nature is that grasses keep growing – – – I haven’t mowed my lawn yet this year, and it’s starting to look overgrown. Tomorrow or Friday I’ll be plugging in my lawnmower (it’s an electric model). CB, did you buy any underwear? I’m still chuckling. I missed the sale so there’s always next year. Hi, Cindy. Right, spring has a lot going for it. It’s my second-favorite season. I like autumn the best, maybe because it gives relief from the heat of summer. Enjoyable as ever, Neil – looks like your neighbourhood has a lot of spring flowers in common with my part of the Scottish Lowlands. The highlight in our garden at the moment is an azalea which year upon year, keeps giving us more and more purple blooms. 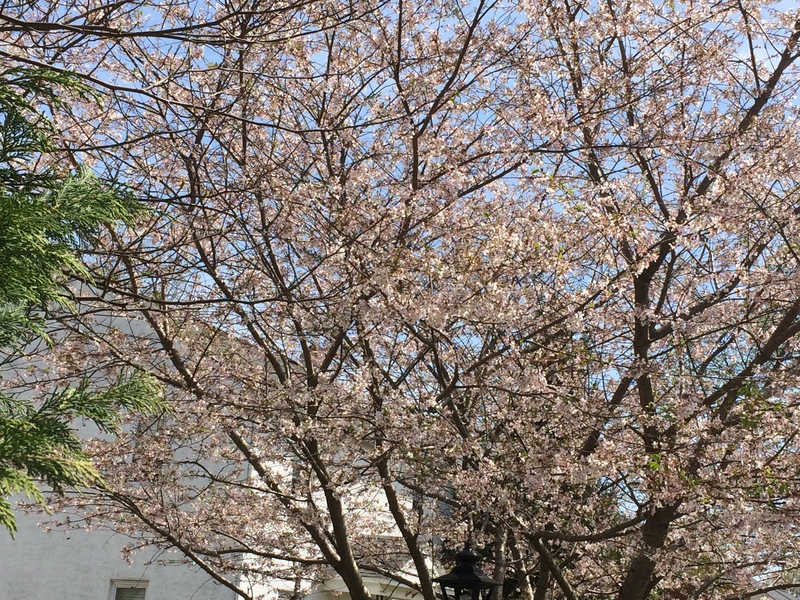 But round the town, the cherry trees are the stars! Hi. I’ve always liked azaleas a lot. I once saw orange azaleas growing in a forest. Not sure if I’ve ever seen the orange variety in cultivated gardens, though. Lovely photos. Enjoy what you can, summer is fast approaching. All of the parking garages I’ve been in have credit card reading machines. Anywhere without one is like stepping in a time machine. Hi, Stacy. True, it’s not exactly consumer-friendly for this parking garage to be cash-only. Most people, though, seem to take it in stride. I’m sure spring is in the air here as well. If the snow would stop, maybe I could see it. I didn’t know there still was snow out west. Where I live (near Philadelphia) we’ve had lots and lots of rain the last month. Hello. Thank you very much. I appreciate your saying this. Love all the different shots! Spring is so varied and you really captured it! Hello, and thanks for stopping by. I’m glad to have a visitor from Denver. Lovely to read about someone else stopping to notice the seasons and the colours! It’s so easy to forget the changes with the movement of daily life! Hello. You’re right. Most people don’t spend much time outdoors. That’s been true for many years, I suppose. 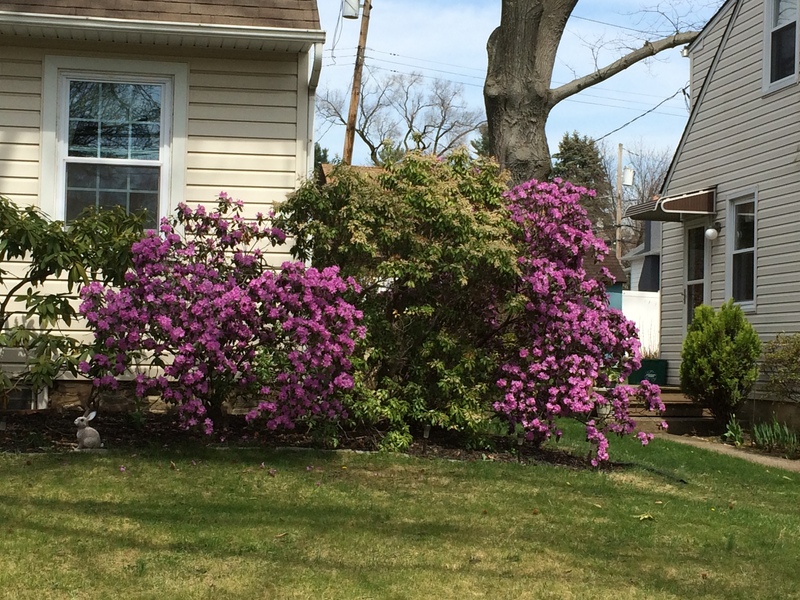 The colors of spring have mostly faded away since I wrote this article. The long hot summer has begun to set in. And talk about rain! — my region of the USA has had amazing amounts of rain the last six or eight weeks. That’ll enough weather talk on my part.